Everyone wants Sazerac and Buffalo Trace Bourbon and, believe us, we want to sell it to you. We never gouge on price, we are a legitimate, primary market, licensed liquor store in Acton, Massachusetts. For all the enthusiasm that we have for Bourbon and whiskey, and for all the demand that there is for the good stuff, there is a huge void. If you’ve always wanted to try a Pappy Van Winkle, or if your hunting season is when Buffalo Trace Antique Collection hits the market, you should read on. 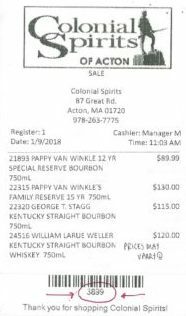 Enter the Colonial Spirits Bourbon Lottery for a chance to win the right to PURCHASE one of the few bottles we are lucky enough to get each year. Once our allocation is in hand the winner(s) will be selected and contacted. The number of bottles put into the lottery equals the number of winners – we do not know what our allocation is ahead of time, so we cannot predict how many winners there will be or what bottles will be available for purchase. Typically the bottles arrive around Thanksgiving. The first name selected gets to reserve, for purchase, one of the available bottles – the one of their choosing from what is available. The second name selected gets to reserve, for purchase, one of the remaining bottles… and so forth until all bottles are reserved. No purchase is necessary, however reserved bottles must be purchased within 2 weeks or another name will be selected. Using the form below, entries may be made using the sale number from your purchase receipt along with your name and email (you will be signing up for our Liquor and Events email lists). Each receipt that you have is valid for one entry and there is no limit on how many receipt based entries you can make as long as they are from unique receipts (no duplicates) and are from different days/ times (breaking your purchase into multiple receipts at the time of check out is not allowed as it is discourteous to others in line). Bottle redemption / item return receipts will not be accepted. Please play fair. Intentional invalid entries, duplicate/fake receipts and other means of cheating the lottery will result in disqualification for life. All rules are subject to the laws and regulations of the Commonwealth of Massachusetts and the discretion of Colonial Spirits. Remember, the lottery is for the right to PURCHASE a bottle. The 2019 lottery is open! To be honest, it’s unlikely that this one will end up in the lottery. It’s rare that we get to see it. Amazingly, the barrel hasn’t overwhelmed this one with oak flavor and the decades of aging have mellowed it out. Another unlikely candidate as it is the number one rated Bourbon in the lineup. One never knows though. As rich as they come with an extremely long finish. This defines Bourbon. So much of what makes a great Bourbon is found in this bottle. Rich barrel flavors, grains, leather, dried fruits, heat… the list goes on. The age alone makes this a unique rye. Beyond that the glass brings out cocoa, vanilla and white pepper. Generally the crowd favorite and likely what made these Bourbons so irresistibly sought after. It’s rich and sweet and easy to sip. The Bourbon that most people wish they could keep as an everyday sipper. It’s the best in class and there are plenty of 10 yr Bourbons to compete with. Uncut, unfiltered, raw and powerful. Hearty is a way to describe it… if you are into understatements. This is for true Bourbon enthusiasts only. It is not for beginners or regular proof drinkers. A mature, cask strength rye with the heat and depth to hide its true character from the faint of heart. The layers of flavor are remarkable. A wheater like none other… Forget soft, like most wheated Bourbons. Filled right from the barrel you’ll get everything that this Bourbon is, and ever was, right in your glass. Beginners – no. Perhaps the ‘Pappy 12’ of rye. Barrel proof, intense and full or flavor, you are going to get a powerful rye. If you aren’t used to raw whiskey (beginners), then move along. The one BTAC release that is for beginners. That’s not to say that it isn’t excellent. This Bourbon is soft, fragrant, refined and delicious. It’s just so welcoming that anyone would love it. 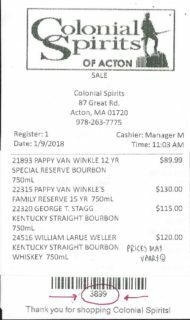 For all of you out there who want great Bourbon but wish to avoid the heart-ache of chasing the abovementioned rarities, Colonial Spirits of Acton does regularly offer plenty of other options. Now… ‘regularly’ is a relative term. We even get our own private barrels of Old Weller Antique and Buffalo Trace. They tend to go quickly but there is generally enough to go around.